TamilNet: 22.11.03 Paper slams EU peace visit as "pig headed act"
Commissioner of External Affairs of the European Union, Mr. Chris Patten’s visit to Sri Lanka next week is expected to draw strong protests from Sinhala nationalists, political observers in Colombo said. 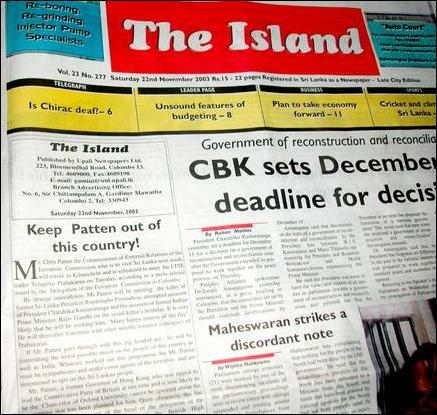 ‘The Island’, an English daily published by President Chandrika Kumaratunga’s uncle, slammed Mr. Patten’s plan to meet the Liberation Tigers in Kilinochchi next Tuesday as a “pig headed act” in a prominent front-page editorial Saturday. “This is bloody European gumption and insolence of the highest order”, the paper said. The paper demanded that the EU External Affairs Commissioner should be barred from entering Sri Lanka. ‘The Island’ reflects Sinhala nationalist opinion in all its aspects. Its sister paper, the Sinhala daily Divaina, which enjoys wide circulation among the Singhalese is an unabashedly racist publication, consistently fanning anti Tamil sentiments and promoting Sinhala Buddhist supremacist ideals. Meanwhile, Daily Mirror, an independent English daily published from Colombo, said Mr. Patten’s plan to meet the LTTE leadership is "likely to trigger controversy". Most Sinhala nationalists and all Sinhala extremists say that the peace process to end Sri Lanka’s ethnic conflict is a sinister conspiracy by western countries to divide the island. Mr. Chris Patten, Commissioner of External Affairs of the European Union. Sinhala nationalists led by a section of President Kumaratunga’s People’s Alliance, the Janata Vimukthi Peramuna (JVP), which has emerged a powerful third force in Sinhala politics and the smaller but extremist Sihala Urumaya have been demanding that Norway, which, according to them, is the cat’s paw of the western conspiracy, should be stopped from facilitating the talks between the LTTE and Colombo. They propagate the view that European civilisation and Christianity are at the root of all calamities that have befallen the "ancient Sinhala Buddhist civilisation of Sri Lanka". The Sinhala nationalists argue that European involvement in the peace process is a neo-colonial project in disguise. “Such is the European perfidy from which we Asians have suffered for over five centuries”, the Island editorial said.